Amniotic membrane patch being applied to a heart during surgery. The patch is now in a clinical trial to determine its effectiveness in treating post-operative atrial fibrillation. Hoping to reduce post-surgical deaths in cardiac patients, a University of Arizona surgeon is testing the healing powers of heart patches made from amniotic tissue. The intent of the patch is preventing atrial fibrillation, which is an irregular, rapid heart rate caused by chaotic electrical signals in the heart’s upper two chambers, or atria. In postoperative patients, atrial fibrillation causes permanent damage to the heart and puts the patient at risk for major complications including stroke and heart failure. Dr. Zain Khalpey, surgical director of the Heart Transplant and Mechanical Circulatory Support Program at The University of Arizona Medical Center, says he has performed the world’s first procedures using an amniotic membrane patch to help heal a patient’s heart postoperatively. The amniotic tissue used to create the patch comes from Earlier Technology, a company out of Phoenix. The tissue is harvested from donors who have had cesarean births. Atrial fibrillation, the most common type of arrhythmia, can also occur unrelated to surgery. Yet, the development of atrial fibrillation is a significant risk following cardiac bypass and valve replacement procedures. 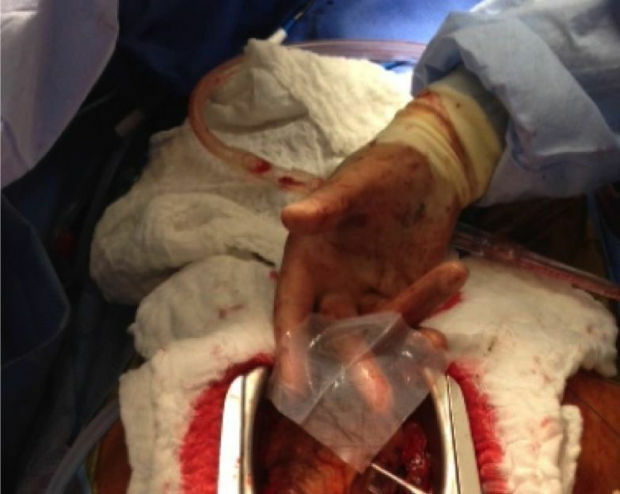 In Khalpey’s clinical trial, an amniotic membrane patch is placed over the surgical site during heart surgery. Its anti-inflammatory properties actually cool down the heart, decreasing the risk of complications. The clinical trial is just beginning to enroll patients, but the patch has already been used successfully on patients following heart surgery at UAMC. Out of the 27 “pilot patients,” the first patients to use the patch, only one developed atrial fibrillation. The success of these initial results led to the creation of the clinical trial, which will include a much larger sample of patients who will be observed and evaluated in a controlled environment. Khalpey intends to carefully break down the different responses from valve and coronary artery bypass grafts. Khalpey’s procedure and the study have already gotten some international attention, as it was the focus of an article in the UK Daily Mail. Khalpey’s work offers an “innovative approach to prevent postoperative atrial fibrillation,” said Dr. Sean R. Wilson, a cardiologist with Valley Health System in New Jersey. “To date, prophylactic strategies for atrial fibrillation have primarily included medications such as beta blockers, antiarrhythmic therapies and atrial pacing,” Wilson said. Amniotic tissue has been used to treat diabetic wounds and some eye conditions for a number of years. The tissue is comprised of the inner layer of the placenta that supplies blood and nutrients to the baby in the womb. According to Khalpey, the tissue is unique in that it doesn’t produce an antibody response in the body like transplanted organs do, so immunosuppressant drugs aren’t necessary. It also promotes faster healing and helps to repair and remodel the myocardium, the middle layer of the heart. Postoperative atrial fibrillation doubles the risk of a patient’s death, according to an August 2014 study published in The Annals of Thoracic Surgery. Patient’s can also expect to stay an additional 48 hours in the Intensive Care Unit, three additional days in the hospital and up to $9,000 in additional hospital-related costs. An additional benefit of the patch, Khalpey said, is that patients won’t need to take anticoagulants following surgery. Anticoagulants, or blood thinners, are prescribed to patients with atrial fibrillation to prevent blood clots and strokes. But by thinning the blood, they carry the risk of excess bleeding. “The patch is really a different type of animal than anything that’s been used before.” Khalpey said. Because it’s biological, the patch breaks down in the body in 90 days, leaving no trace behind. Khalpey’s study, detailing the procedure and initial success, is being published in the January issue of the American Journal of Medicine, along with MRI images to support his data. There is a side-by-side comparison of a normal post-surgical heart to one with an amniotic patch, in which the patched heart is visibly cooler in temperature, indicating less inflammation. The amniotic membrane patch clinical trial currently is enrolling patients who will be undergoing valve or coronary artery bypass graft procedures. Eligibility requirements and information on how to sign up can be seen at: http://clinicaltrials.gov/ct2/show/NCT02193321.